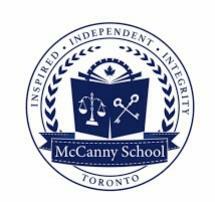 McCanny Secondary School is a full-time private high school monitored by Ontario Ministry of Education (BSID#669808) and has the right to grant Ontario Secondary School Diploma credits for grade 9-12 students. With our top courses, such as our art program, robotics course, language center, math, university pathway and tutoring, students are set to succeed. As a result, we have guided a lot of students to achieve their goals for university. 98% of our teachers have Master's degrees and PhDs.